Copper has also been quietly performing. Yesterday copper broke up through its 200-day moving average, which is an important technical win; at least some of today’s buying would have been from those who trade on technicals and therefore moved to buy based on that win. Charts aside, there are new fundamental forces also driving copper. By new, I mean forces in addition to the background of insufficient new supply to meet demand over the medium term. I go through that situation in the next issue of Maven Metals, due out tomorrow. Here, rather than repeating the big picture, I want to run through some of the copper news of late that has helped tip the market towards bullish. The context here is important: copper is always a tight market, one that churns through 22 million tonnes a year, but usually has a surplus or deficit of just a few hundred thousand tonnes. And copper is essential for development. 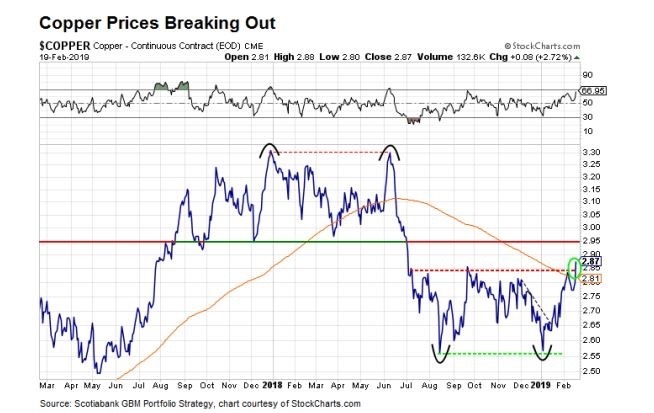 Put those together and you have a tightly balanced market for an essential commodity, which means supply disruptions tilt the balance pretty easily. And right now we have several supply disruptions. Freeport Indonesia’s permit to export copper concentrate expired in mid-February and so far the company has not made progress obtaining a new one. The Grasberg mine is responsible for some 2% of global copper production and FCX has been negotiating with the Indonesian government for the last few years to get around new requirements to process concentrates domestically. A series of permit extensions have kept the mine going in the interim but the permit situation plus the tricky transition from open pit to underground block caving at Grasberg, which is happening this year, combine to mean Grasberg output is truly under threat. The Vedanta copper smelter in India remains suspended after India’s Supreme Court overturned a lower court ruling to restart the 400,000-tonne-per-year operation. Vedanta suspended the smelter last March for maintenance but then extended the closure in the face of major local protests over its pollution. The smelter’s permit was then revoked in May when police killed 13 protesters. With Vedanta shuttered, India is importing 110% more copper than usual and the copper spot price rose 1.1% when the Supreme Court ruling was announced. In Peru a nationwide trucking strike is slowing metal cargoes. In the DRC, Glencore recently announced a plan to reduce output from its Mutanda mine as it figures out a mine plan going forward. And in Chile regulators just filed charges against Lumina Copper for allegedly extracting too much water from the wells at its Caserones mine, an infraction that could result in a temporary suspension of operations, a charge, or revocation of the mine’s permit to operate. It feels like a flurry of news, but that’s normal for copper. When a market is tight, every tonne matters. That means losing Caserones or part of Mutanda’s output or just the threat of losing Grasberg – they all matter and they all boost the price of copper. Between strong fundamentals (the copper market is in deficit already and will remain so for the next four years!) and new, near-term forces like these, copper has enjoyed a stealth rally. Recent gains don’t look very dramatic on the chart below but what matters is that the red metal, which has been in the US$2,55 to $2.85-per-lb. range since last summer, broke up out of that range and through its 200-day moving average. Assuming it continues, the move up also completes a double bottom pattern. Copper is nicknamed the PhD of metals for its tight connection to macroeconomics. For the price to continue gaining suggests that the market sees better days ahead for global growth (like a trade deal perhaps?). 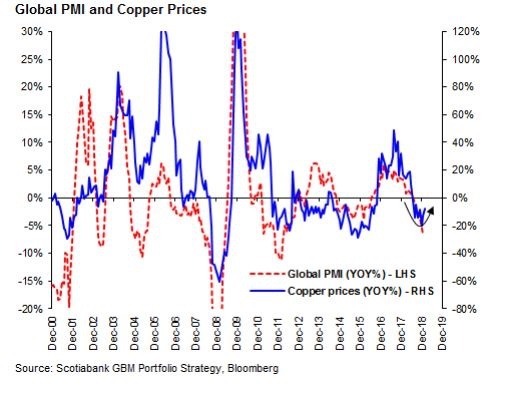 As Scotiabank analyst Hugo Ste-Marie shows in the chart below, the 12-month change in copper prices and the global PMI (manufacturing index) move very closely.